It’s winter time; have you taken in your flu vaccine? According to the CDC, about 43% of adults age 18 and up reported receiving the vaccine in 2016-2017; this is up almost 5% from 2011-2012. This seems low to me, considering that pretty much everyone talks about getting the vaccine as a matter of civic duty. Co-workers and friends seem to brag as if by getting a shot, they have single-handedly stopped the flu in its tracks and that we as global citizens owe each other a warm bacteria-free hug of gratitude for making that trip to the doctor (or pharmacy). Not me. This may not be politically correct and it may spark controversy, but I don’t do the flu vaccine. It’s not that I am against vaccines; on the contrary, I think getting vaccinated against those deadly and contagious diseases from the 1800’s like the measles, leprosy and scarlet fever is a great idea! 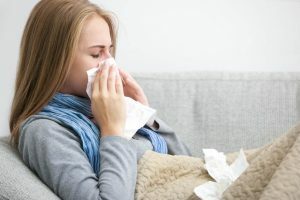 But I think if you’re youngish, relatively healthy, don’t work with children, the elderly or in the medical field and have decent immunity, you should be able to forgo the annual flu shot for a while. This flippant attitude may result in me eating (or coughing) my words later, but more importantly, it (admittedly) illustrates a potential lack of conscientiousness which has been reported to improve longevity. Numerous studies including this one have shown that individuals who show conscientious behavior tend to also have better health habits, especially when it comes to diet and exercise, managing stress, alcohol and drug use, risky driving, smoking and other factors. In many cases, these behaviors, along with other cognitive qualities, translate to better overall health and well-being which promotes longevity. As individuals get closer to retirement, conscientious behavior could become more important not only for longevity purposes but also to help keep individuals healthy and their health care costs manageable in retirement. 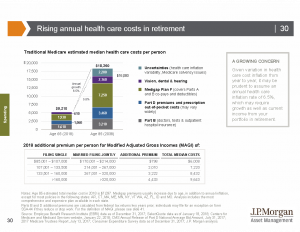 It is widely cited that health care costs are the fastest growing costs for individuals in retirement. Over the past few decades, health care expenses in retirement have grown annually by about 5% on average, although the growth rate has slowed over the past decade. However, health care costs can increase unexpectedly several years into retirement, so it’s important to work with a qualified retirement advisor who can develop a plan and stress-test the plan to help manage these uncertainties. According to 2018 research from Fidelity, the average couple should expect to spend about $280,000 on health care alone in retirement. While the year-over-year growth in costs has slowed in recent years, consider that this represents a 75% increase since 2002; a couple retiring in that year could expect to pay about $160,000 for health care costs. Many of the factors that go into the cost determination for this annual study are based on market or economic changes and can vary drastically from year to year. Despite the variables, many people don’t have a gauge on how much health care costs can climb and tend to underestimate these costs. In the Fidelity study, 46% of the respondents believed that they would only need about $100,000 to cover heath care costs in retirement, and almost half said they were dipping into personal savings in order to pay for health care. Further research on this topic by JP Morgan Asset Management illustrates how costs may change during retirement. 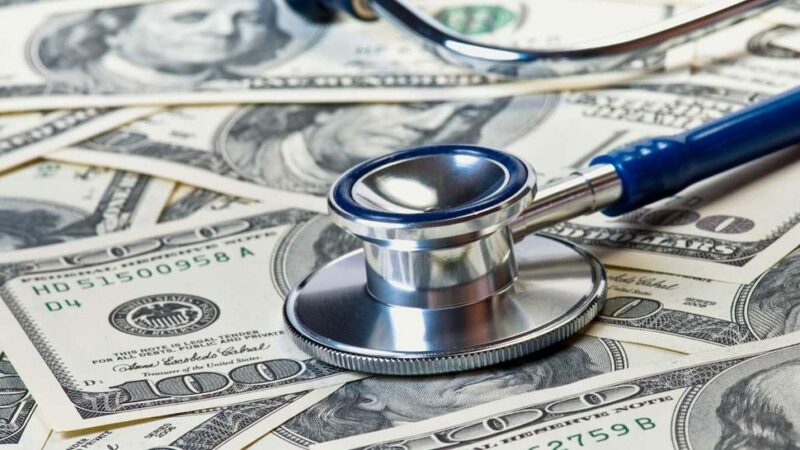 Their research revealed that the average 65-year-old retiring and signing up for Medicare in 2018 is likely to spend about $5200 a year initially on health care costs. This includes the cost of Medicare premiums, co-pays and other out of pocket health care costs not covered by Medicare and does not include long-term care (LTC) costs. The chart below illustrates how the annual costs are broken down among the different parts of Medicare, Medigap which is a separate policy individuals take out to cover costs and payments not covered by Medicare, and vision, dental and hearing which are also not covered by Medicare. For an individual in good health at age 65, this annual cost of $5000 seems reasonable. However, consider that health care costs grow faster when you’re in retirement, and based on the combined historical and projected growth rate of the different parts of health care, this same individual may see his annual costs more than triple to $18,000 by the time he turns age 85. These high costs may be tougher to manage once an individual is already well into retirement, so it pays to plan. Beyond health care costs that cover the cost of hospitalization, doctor visits, tests and medicine, many people in retirement develop conditions that are chronic, specialized and may be debilitating. Long term care (LTC) helps to support an individual’s management of their daily activities and lifestyle (also known as “ADLs”), which include bathing, dressing, transferring (moving from a bed to a chair), eating and caring for incontinence. Most insurance policies that provide LTC funding require an individual to be unable to complete 2 of the 6 ADLs in order to qualify for LTC insurance. Long term care can vary from occasional home health visits by a health worker to long term nursing home care, so costs may vary from person-to-person, and these costs can be unexpected. Consider that 70% of individuals age 65 will need some form of LTC support, and while 1/3 of retirees will never need LTC, 20% of individuals will need LTC for five years or longer. Medicare pays for very short term LTC events and costs, so the primary source of funding comes from individuals in the form of self-insuring/paying for costs out of pocket or LTC insurance policies and hybrid annuities. While many retirees may never need LTC support, and even fewer will set foot in a nursing home, consider that the average annual cost for a private room in a nursing home is about $100,000. These costs vary by state so a private room in Oklahoma may cost $63,500, but in Alaska the same room will cost you over $330,000! Retirement comes with uncertainties. Managing healthcare costs in retirement requires careful and conscientious planning. Consider working with a qualified advisor who can help you develop a plan that includes the appropriate inflation rate for health care costs, and can advise you on your long-term care planning options.